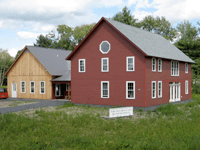 In July of 2008, New England Slate moved into our “new” office and shop in Poultney, Vermont. It’s hard to believe that almost 10 years has past. It’s been a great place to come to work everyday. I’ve been with New England Slate for only five years, but I know it’s the best work environment in the slate valley! I am always proud to say I work at New England Slate. Below is the write-up of our “new” space that was on our website for years. Although we decided to archive the description when we updated our website, our invitation to come visit still remains true. We would love to show you around and discuss your next slate project. 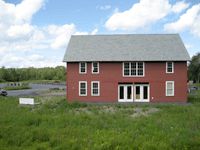 In 2007 The New England Slate Company began construction of a new facility in Poultney, VT and moved in to the new quarters in July of 2008. The location is more central to the Vermont and New York quarries and provides the space and facilities for future growth. Efficiency of operations and efficiency of energy use were key components of the building design, and the project was recognized in 2009 with a Governor’s Award for Environmental Excellence & Pollution Prevention. 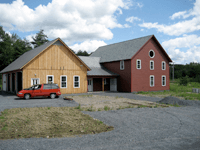 The building is wood framed and designed to look like a New England barn with a clapboard exterior and of course, a natural slate roof. The attached shop area is sided with locally harvested white pine that is applied in a board and batten style. 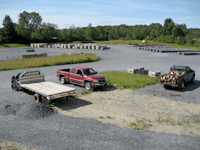 Surrounding the building is a large outside storage area for the inventory of palletized roofing slates and zones to load and unload trucks. A large area around the office/shop building was graded and sloped to help drain any surface waters away from the stored pallets. Slate rubble from the quarry was used to create a porous subsurface layer and then crushed black slate was applied as a top layer. Since finished slate products represent less than 10% of the stone removed from a quarry, this material was an especially good use of a readily available local resource. The dark color will minimize the reflection of the sun’s rays in the summer and absorb the radiant energy in the winter to hasten the melting of snow and ice. The structure was oriented due south to take advantage of solar gain in the winter. Window locations and masonry surfaces were linked to capture the sun’s radiant energy. Insulating concrete forms were used to build the foundation walls and super-insulate the concrete slab that encased the radiant heating tubes. With ample access to firewood and a strong interest in red ucing our reliance on fossil fuels, we chose a wood gasification furnace as the main source of heat for the entire building. 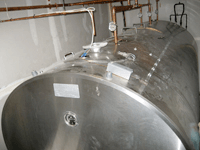 This super-efficient, minimally polluting furnace was connected to a recycled dairy bulk tank that is insulated to serve as a large reservoir of hot water, which is the source of heat for the radiant floor system. 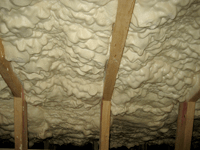 Icynene spray foam insulation was applied the ceilings and walls of the building to minimize heat loss and prevent air infiltration. The office spaces are wired for the latest high-speed phone and Internet connections to ensure fast and reliable service to all our customers. Interior window and door casings are made from the same locally grown and milled white pine as our shop siding, creating a refined rustic ambience. With lots of space for our roofing slates and a well-designed, efficient building to house our operations, we are perfectly positioned to continue providing our customers with top quality slate and industry-leading customer service for generations to come. Come visit us at our new location. We’d love to show you around and discuss your next slate project. I hope this post kept your attention and you read all the way to the end! If so, send me a quick email at nan@newenglandslate.com and I’ll send you one of our famous “I’d Nail That” t-shirts.